Author’s Note: We were provided with a free copy of this novel in exchange for a fair and honest review. 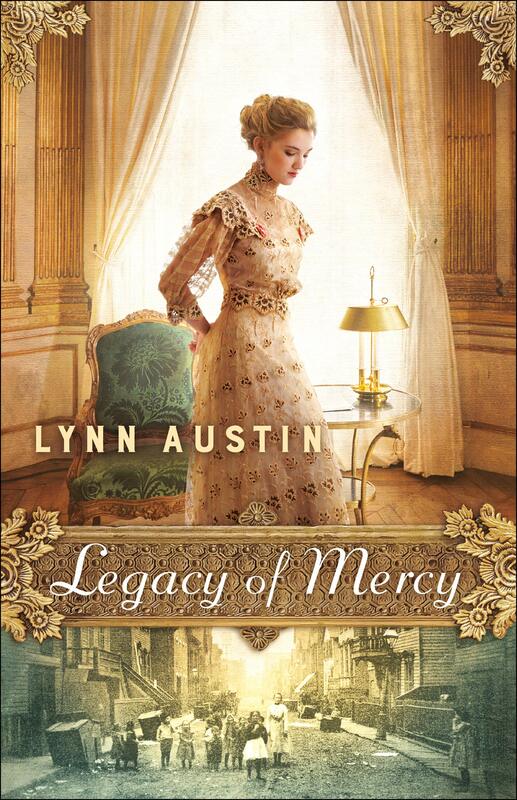 Lynn Austin has caught her second wind in this second installment of her Waves of Mercy series. Reminiscent of great novels like her own A Proper Pursuit, this plotline brings back warm, familiar memories of stories gone by, and builds upon the foundation she has set for herself as an author. In the first novel of the series, Waves of Mercy, I was afraid her talent was waning. However, I am pleased to say that Austin is back and better than ever. Legacy of Mercy tells the continued story of Anna (Anneke), Geesje, and Derk, along with some new characters that add much to the story. Anna has returned home from visiting her fiery and deeply spiritual grandmother – whose existence she has only just become aware of – and returned to a busy social schedule full of meaningless obligations and events. Now that she has discovered the true meaning of life, to love, serve, and worship her loving Savior, everything else seems inconsequential. Anna feels uneasy about her impending wedding to William, a young man from a rich family whose fortune will save her parents from bankruptcy, and is unsure if this action is worth the cost. However, she resolves herself to marry him despite the whispers of her conscience – for her parents sake. In the mean time, she has hired the Pinkerton detectives to search for records of her deceased mother’s life. (spoiler) This decision, however, soon opens a Pandora’s box of painful information and buried memories, and may cost her everything she knows. Geesje, Anna’s grandmother, feels like she has been parted forever from a granddaughter she only just met, because she has no idea when or if Anna will return. She is not left alone for long, for almost at that very moment someone shows up at her door to request that she take in a needy young woman who has recently emigrated from the Netherlands. Geesje agrees to do it, mostly because she remembers her own experience as a young woman in a new land. Cornelia, her new companion, is in poor health, reclusive, and equally angry and sad. Geesje struggles to reach the hurting young woman, and wonders if her cause is hopeless. Meanwhile, Derk is secretly in love with Anna and doesn’t know what to do because she is engaged. He feels unworthy of her love because he is only a seminary student and cannot give her the wealthy lifestyle she is used to. All of these people are, in some way, hurting. They must each allow God to direct their steps in order to find healing and help. The plot and storyline quality of this novel is phenomenal. There are no major errors, and the story is very engaging and poignant. Austin covers many difficult topics well and displays a deep understanding of people who are hurt by the church. The only flaw I could find was that the ending of the novel is a bit predictable. However, this experienced author has proven that her star-studded career is not ending anytime soon. As per usual, Austin’s characters are flawless. Those in this novel seem to have been developed with special care, as each character has extremely relevant flashbacks and real emotions. Austin avoids the information dump style of writing by giving even the secondary characters first person flashbacks. Additionally, her unique style of first person keeps the reader in the know without being overly wordy. Anna, Geesje, and Derk are all perfect. Furthermore, Cornelia is masterfully crafted. In short, this story will touch the lives of many people. Austin earns a well done from this author for adapting her trusty writing style to reach younger generations and hurting people. Finally, Legacy of Mercy is a rare sequel that is better than the prequel. Where Waves of Mercy was wordy at times and a bit too depressing, this novel jumps on to the scene with a good mix of laugh-and-cry moments that will touch the hearts of many readers. For this reason, Austin’s newest novel earns a full point for creativity, and a half of an x-factor point in originality for building upon the character models and plot devices found in A Proper Pursuit. This is why I believe this book series would make a great Christian TV series. Step aside WCTH, here’s a real historical romance that will minister to real people and influence the culture for the better! If more Christian authors would write like Austin, we would soon see a blessed change.